Depending on where you are in your therapy dog journey, you may opt for a Canine Good Citizen class or another form of obedience class. If you've been through a few obedience classes, you may want to try a class for fun, like agility, nose work, or tricks. In the vast majority of these classes, you'll be around other responsible dog owners supervised by a dog trainer you trust. Classes are an ideal environment to practice good canine citizen behavior around other dogs. Plus you'll get consistent feedback from your trainer. There are few places I've walked our dogs where I didn't run into other people with their dogs. If you're fortunate to live someplace where you can have an isolated stroll with your pup, don't choose that option every day. Bring your dog's favorite treats. I recommend using a treat pouch over your shoulder or around your waist for easy accessibility. Watch your dog's body language as other dog's approach. Watch the other dog's behavior too. Depending on your dog and the advice of your trainer, reward neutral behavior with praise and possibly even treats. One store where you have a pretty good chance of running into other dogs is PetSmart or your local dog-friendly pet store. Ask the employees or manager for their busiest and slowest times for dog visitors so you can make a plan that's best for your dog. Bring your dog's favorite treats, and stand off to one side of the entrance. As people come and go with their dogs, work with your dog rewarding neutral dog behavior. If you have your treat pouch visible and you're focused on working with your dog, most people will ignore you and allow you to train. You don't have to have an "In Training" vest on your dog, although they can be useful, especially if your dog has reached the point where verbal praise and pets are your main form of reward. You can also just say that you're training to indicate that you're not meeting people at the moment. I would consider this option more advanced. Depending on how many dogs are in the dog park and how rambunctious they are, their behavior cold prove quite challenging. Before you intentionally walk your dog past a dog park, take a few minutes to assess what's going on inside the dog park. If you think that walking along the fence will be good practice, then have your treat pouch at the ready, and start walking. How you reward with praise, pets, and treats should be part of your conversation with your trainer, especially as your dog gets better at ignoring the other dogs. 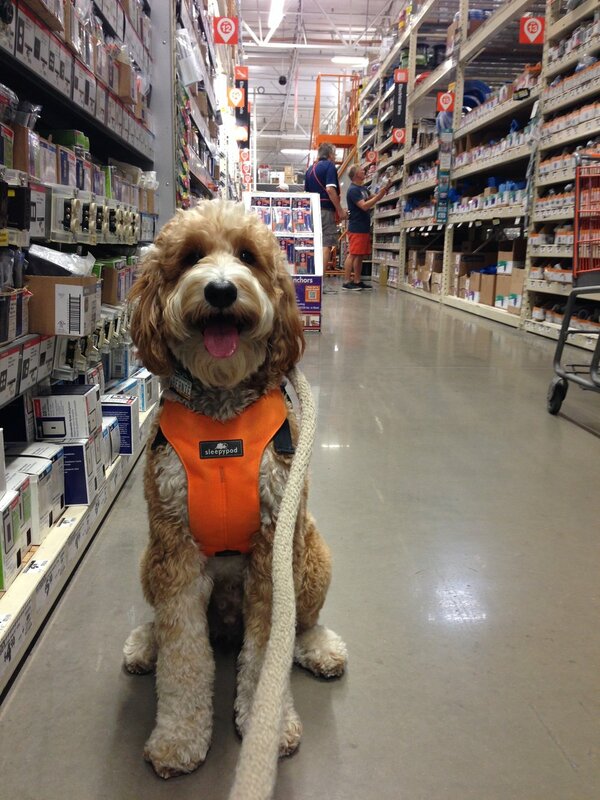 Do your research on which stores in your area allow leashed dogs. Walking through these stores gives you the chance to maneuver around people, displays, cash registers, and other strange objects. Be sure to check store websites too for any special events. If they're running a contest or promoting anything with a celebration, then that may be a good time to visit and train. If your local Humane Society or rescue hosts a dog-friendly event, go support their cause and get the benefit of walking through a crowd of dog lovers! Chances are there will be a variety of people there as well with different age ranges. Depending on how culturally diverse your city is, different ethnic backgrounds may be represented as well. Check your city or township's events calendar for specific dates and times of games. If the park is large enough, you can arrive early and get in a good walk. Then walk through the crowds of people as they arrive for the game. If the crowds starts to get too large for your comfort, leave. Browsing yummy offerings from local farmers and merchants is a fun option for training destinations. If you're concerned that the farmer's market may be too crowded and your dog could get hurt, try attending in the last fifteen minutes or even after the merchants have closed shop. They still need to break down their booths and transport everything home. Even though you may not get to purchase much, your dog will still get the benefit of walking through that more manageable crowd. While you could meet a variety of people while you're walking through crowds, you may also want to choose smaller gatherings. Whether it's a neighborhood block party or a casual dinner party, if you're hanging out with dog people, ask if you can bring your dog. Let people know that you're training and you'll probably have a line of volunteers who would love to meet your dog, shake his paw, and heap on the praise. Meeting people outside a grocery store is almost always quick. People either want to get inside to get their shopping done, or they want to get their groceries into the freezer before they melt. If the grocery store has a patio, then you can sit solo or ask a friend to join you. If you have a full-time fire department in your city, then it's probably staffed 24/7. If you're in a smaller area with a volunteer fire department, find out which day of the week they train. Chances are stopping by for a few minutes will be just fine by the fire fighters. If they get a call while you're visiting, just stay out of their way. Meeting fire fighters and paramedics is also a great way for your therapy dog in training to be exposed to more people in uniform with strange objects. If you want your dog to see people in scrubs, then sit on the patio of the most popular coffee shop closest to a hospital. If you want to know when more doctors and nurses pass through, ask the baristas. If you're not a guest of the hotel, be sure to ask if it's okay for you to sit in their lobby for a bit with your dog. Most hotel staff wear uniforms, so that's great exposure right there. You may also see pilots or airline personnel come through or other hotel guests. Some will breeze right by you and your dog. Others will be missing their pup back home and want to spend a few minutes petting yours. I know that this one is not really a destination, but if you're visiting a variety of places, don't let opportunities to meet people in uniform slip away. If you're out with your dog and you see a police officer, a delivery person, or anyone in the military, assess how busy the person looks. If they look like they're open to meeting your dog, then ask. Some people will say no, which is fine. Others will be more than happy to spend two minutes saying hello to your dog and making a positive association with that uniform. If you have popular community meeting spaces, be sure to ask if they are dog-friendly. If it's a dog-friendly store with a meeting room, be sure to check their website or get on their community news email list to find out what kinds of presentations or events they may be hosting. Not only could you be training your dog, but you could learn something new. Some stores will host giveaways and hand out prizes too. Depending on the size of the meeting room, your dog could be exposed to people speaking into microphones or with booming voices, people dropping things, audience members clapping, and any music or noise that might come from the presentation itself. With all the delicious smells, the clinking of dinnerware, ambient music, and chit chat from the other guests, having a meal on the patio with your dog is a great way to normalize all of those sounds. Most of those sounds will probably not be unfamiliar to your dog either. The volume is just amplified, so it's effective practice. If you think eating an entire meal might be too much for your dog to handle in terms of distractions, then order appetizers instead. If you have a neighborhood bar or restaurant with live music once a week or month, then walking on the outside of that patio is worth your time. If you have an outdoor mall that plays music, take some walks there. If you hear an ice cream truck, walk toward that music, even if it really is annoying. If there are outdoor events for children with live music, hanging out near them can expose your dog not only to the music, but the sounds of kids singing, dancing, and clapping along. Parks and playgrounds can have so many great noises and distractions. Kids make all kinds of sounds, especially when they play. If there's a swimming pool or splash pad, be sure to walk by those water sounds. If you see people practicing in a batting cage, celebrating a birthday in a ramada, or using any of the other park facilities, then walk by. Let your dog hear people being people. If you have any collection of restaurants with outdoor patios near you, check them out first thing in the morning. Visiting on Saturday and Sunday mornings may yield more trash if the restaurants were busier on the weekend nights. After a windy night, you will also probably find an abundance of trash lying around. Same thing with shopping malls. Even if it's just your grocery store parking lot, walking by trash that's blown all over is an effective way to practice "Leave it" in the wild. If you're out for your regular walk and you realize that no one else is around, get a little sneaky with your dog. Drop a few treats on the pathway when your dog is distracted by something else. Notice landmarks so you remember where you dropped the treats, Then loop back on the same pathway a few minutes later. As your dog begins to notice the treat, practice "Leave it." Oh, the Places You've Gone! By visiting a variety of places, you're helping prepare your dog for more scenarios that may come up when you're visiting facilities as a therapy dog team. You're also building your relationship with your dog and keeping things interesting for both of you! Take your time. Space out your journey. There's no deadline. You want your dog to be ready not only to pass the therapy dog evaluation, but also to work with people most effectively. Grab your FREE copy of our ebook by signing up for our monthly newsletter. What's your favorite dog-friendly destination for training?